Resinet SLM40 Square Mesh Barrier Control Fence - Discount Fence Supply, Inc. This polyethylene mesh fence will withstand the worst conditions! 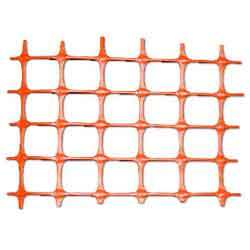 Resinet SLM40 snow fence was developed to replace the old plastic diamond mesh plastic barrier fence. With the vertical and horizontal strands, this product will install easier and still withstand the most severe of weather conditions. A 4'x100' roll only weighs 23 pounds becoming easy for single person installation. This barrier fence is commonly use for sporting events, civic activities, access roads, ski areas, and is most popular as construction barrier fence. Mesh Sizes: 4ft- 1 1/2" x 1 1/4" and 6ft- 2" x 1 3/4"
A 4' x 100' roll only weighs 23 pounds. Ideal for one person to handle. LOWEST PRICE PROMISE. GET A BETTER PRICE? CALL 800.878.7829 AND WE WILL BEAT IT!